I have a laptop with Windows 7 and I have headphones for a couple of months, and only recently they started to play only the music, while the voices are there, but just very faint. 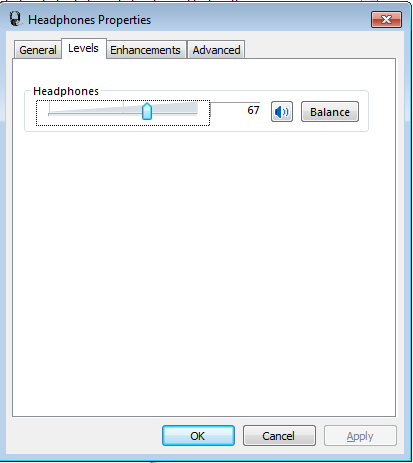 I tried to connect them to another computer (PC, windows XP) and they worked fine, which made me think the problem isn't with the headphones but with the laptop. I've searched online and found a few solutions, none of the seemed to work. Such as: plugging in and out my jack until you can hear better, checking the headphones on other computers. if I right click the sound icon -> sound devices. 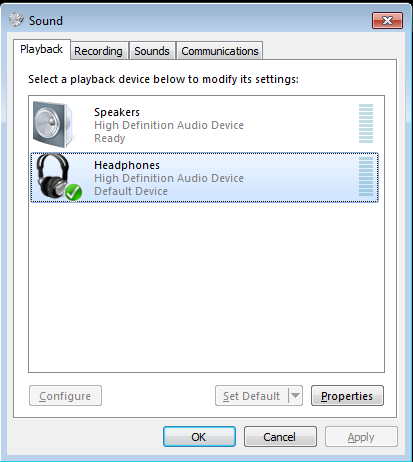 Then I dont see any 'headphones', not even if I tell it to show disabled devices. All I see is a 'speakers' icon, yet it's there even if the headphones are disconnected, and is always active. So if anyone has any idea I'd appreciate it :) Thanks! I figured it out! On my part the voices weren't working, but the background music played fine. While reading this blog, I played around with the balance volumes on speakers while letting a video play. The Balance Volumes that were centered were the only thing not making the voices work!! Thanks a lot. I had the same problem as you describe and the solution was to set one of the Balance values to 0 (see other answer from terdon about how to access the balance setting), rather than setting them both to the middle. Sound card is burnt out. Get a USB audio adapter. I took out my earbuds and plugged them back in (after fiddling with every audio setting I could find for an hour). Worked for me, but I'm unsure why, but, yeah. I found out an solution. I have 2 pcs and a phone, i managed to do the "half-way in and halfway out" method on one of my pcs, the method is basically that you only pull it out a little. But on my phone and the other pc I had to get creative. I messed around in sound settings and changed the balance to only be audible in the left ear, which in turn fixed it! I could still hear on the right side, so I am unsure what the cause is. I'd imagine that it distributes the audio and stuff to more channels than there actually are, and that if you basically eliminate those you will get a better sound. Not the answer you're looking for? Browse other questions tagged audio headphones or ask your own question.